Ding Ning was crowned the Women's Singles champion at the Liebherr 2017 World Championships, beating Zhu Yuling in six games (11-4, 9-11, 4-11, 12-10, 11-6, 11-7). Check out a complete analysis of the match, broken down into numbers. You can find a complete analysis of the match in the article DING NING – ZHU YULING: THE MATCH FOR THE GLORY posted on a table tennis blog, www.zoomtt.com. 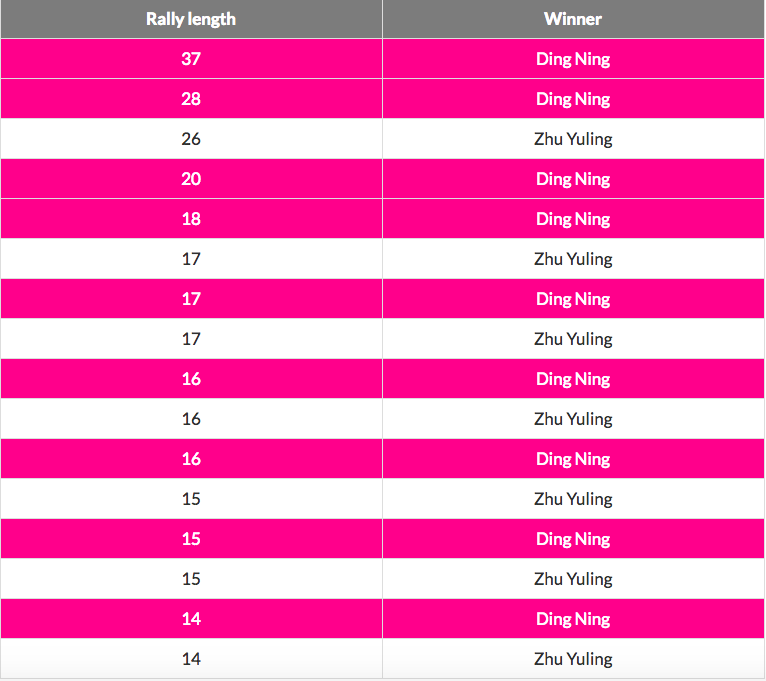 Both Ding Ning and Zhu Yuling have a similar amount of winners, while they differ in the mistakes count. Ding Ning made the longest winning streak of the match, when she cameback from 2-6 to 9-6 in the second set. Nonetheless, that was not enough for her to win that set. The total match average of 7.6 hits per point is the highest of all the analyzed matches up to this moment. It evolved from 4.73 in the first set to 9.13 in the 4th and 7.77 in the last set. 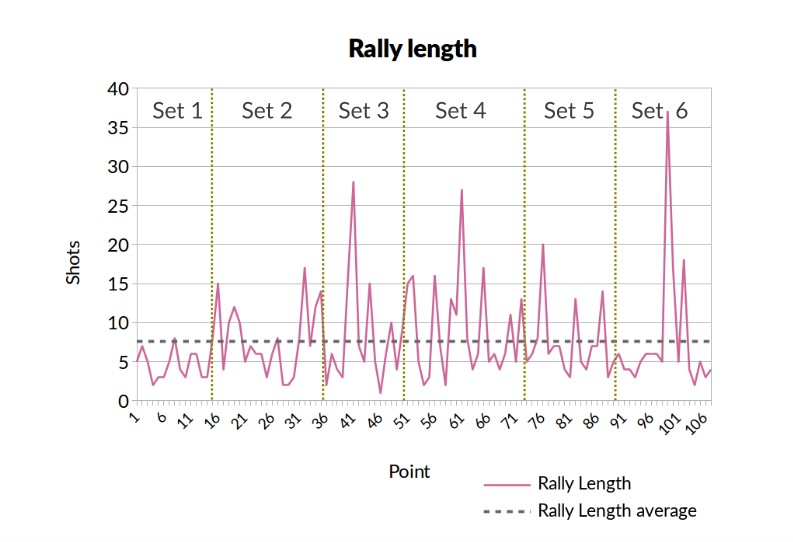 It is remarkable that the sets where Zhu Yuling won, and the one who she lost 12-10, had the highest rally length average of the match, which confirms the theory presented before about that playing in favour of her. Although it is sometimes difficult to determine whether they made a block, active block or topspin, as the strokes are too quick and short, there is a big difference on that aspect between both players. Ding Ning tried and succeeded when taking the initiative with her forehand topspin. Her footwork was better than Zhu’s, who was forced many times to just block with both forehand and backhand. 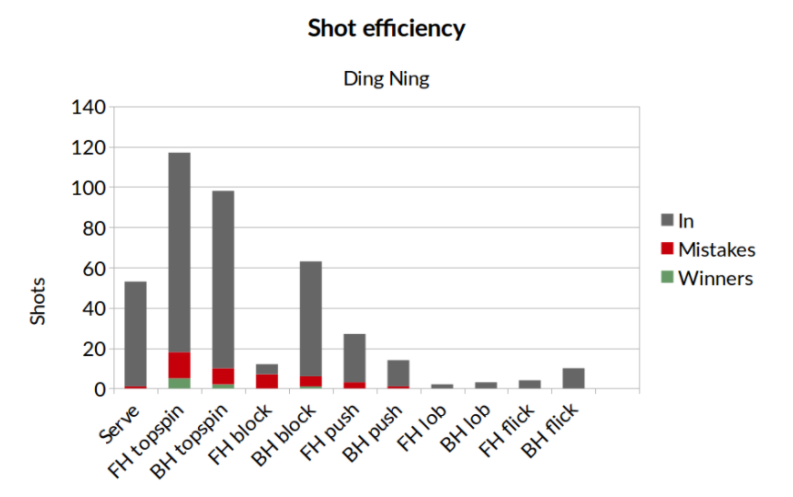 Overall, the forehand ratio of shots is 46.28% in Ding Ning’s side, while Zhu Yuling has a 54%. Most of Ding Ning mistakes come from her forehand topspin. However, the mistake ratio – 11 % – is not very significant. On the other hand, Ding Ning has a 58% mistake ratio when blocking with her forehand, which usually happened when not reaching the ball in time to attack it with a proper topspin. Regarding the winners, she got five out of the eight she had with forehand topspins. Zhu Yuling’s chart has a couple of big red spots: the forehand topspin and the backhand block. Both of them together account for the 67% of her mistakes. As the game got quicker and Ding Ning attacked with her forehand, Zhu Yuling struggled to keep up to the speed, and that is the moment where she got most of the mistakes. Her forehand topspin technique got a bit unorthodox at those situations, which did not help her. The analysis reveals that they hit the ball 65 times in 29.47 seconds, which results in a speed of 2.20 hits / second, 10% faster than the aforementioned analysis where the average speed was 2.0 hits / second. Nevertheless, it must be noted that it is only a small sample of the 107 points that were played in the match and might not be representative of the full match speed. The player’s style and how much they know each other made the match a non-stop battle of quick shots that constantly tried to challenge the opponent’s footwork. Ding Ning overwhelmed Zhu Yuling when it came to that, specially after she was able to use her serve for that purpose and take the point initiative. On the other hand, Zhu Yuling was able to win two sets in a row with two faulty beginnins by Ding Ning, who was not able to come back. However, when she led the match, Zhu Yuling found it impossible to even the score and that served Ding Ning to win the last three sets in a row. The fourth set, where Ding Ning avoided a 1-3 down by winning with a tight 12-10, could have changed everything and we may have had a different World Champion right now. However, Ding Ning’s experience in this kind of situations was the key to overcome that moment and become the 2017 Women’s Singles World Champion.